We've heard a lot about the 200-plus new features in iOS 6, but how will this upgrade affect performance? 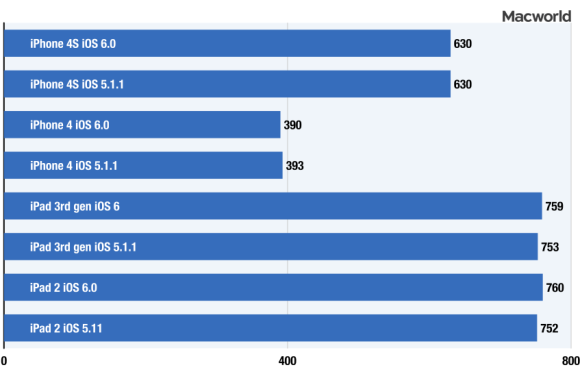 To find out, I grabbed a stack of iOS devices from the Macworld Lab and did some before-and-after testing to see whether iOS 6 performance was faster, slower, or the same as under iOS 5.1.1. Results are scores. 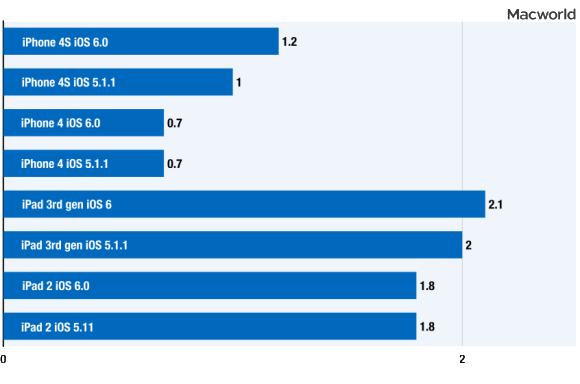 Longer bars are better. Results are in seconds. Shorter bars are better. 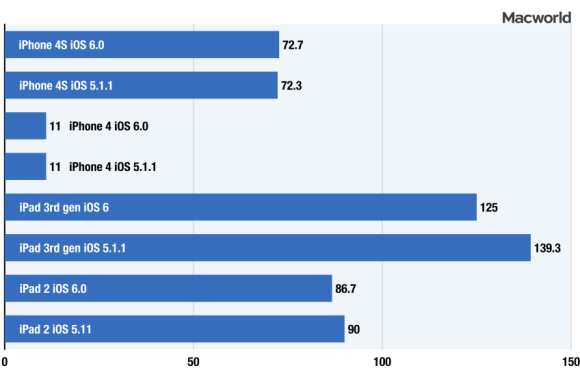 I ran a series of six tests on an iPhone 4, iPhone 4S, iPad 2, and a third-generation iPad. 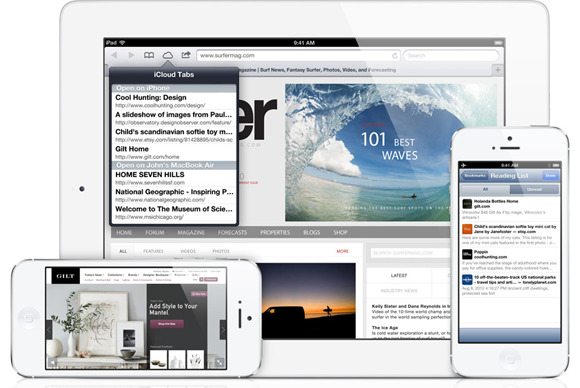 I found subtle performance differences between the two versions of iOS. 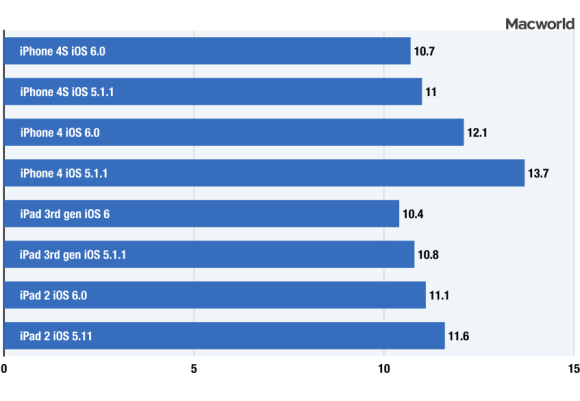 GeekBench scores with iOS 6 were within one percent of the iOS 5.1.1 scores. 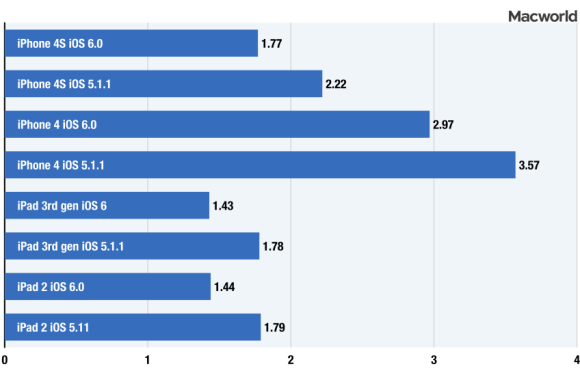 Page load times were less than half a second faster using the new version of iOS. Results are in frames per second. Longer bars are better. 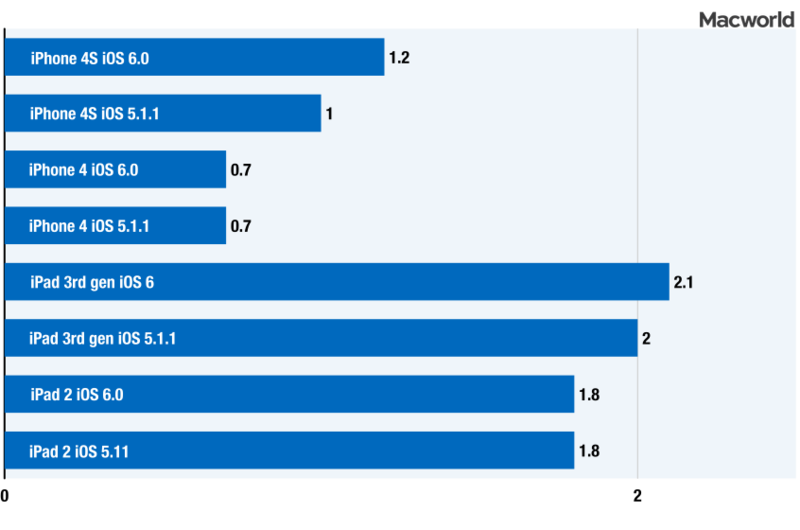 The third-generation iPad showed the biggest performance difference—unfortunately, it wasn’t in the ideal direction. 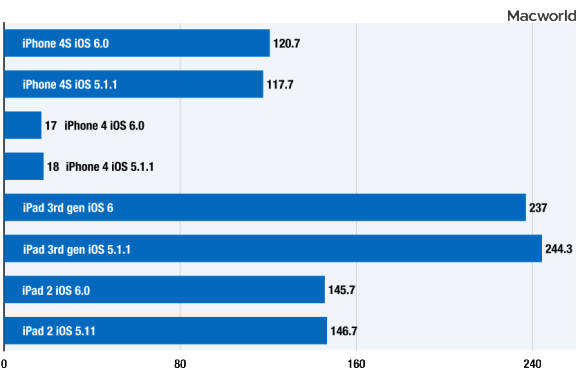 iOS 5.1.1 outperformed iOS 6 by just under 3 percent in the Pro offscreen test, the Egypt offscreen test was nearly 11 percent faster under the old OS. 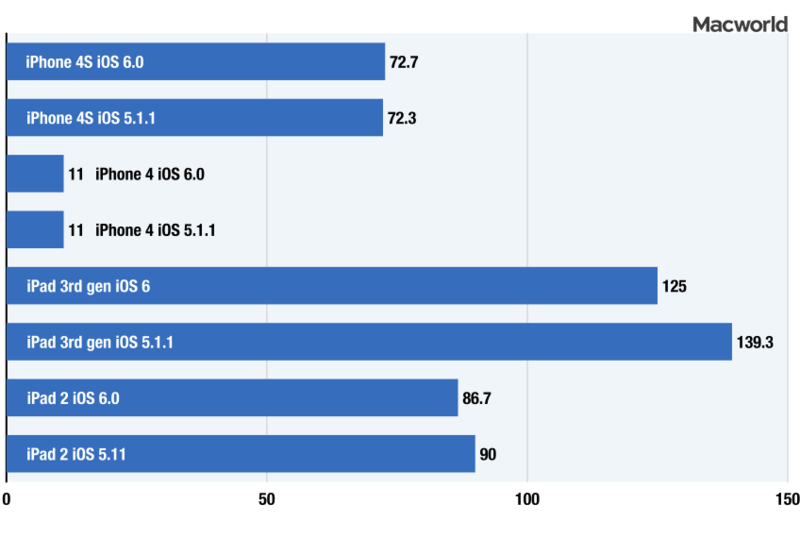 WebVizBench, an HTML 5 benchmark, showed identical performance for the iPhone 4 and iPad 2, but significant gains in performance for iOS 6 on the iPhone 4S and third-generation iPad: 20 percent and 7 percent, respectively. 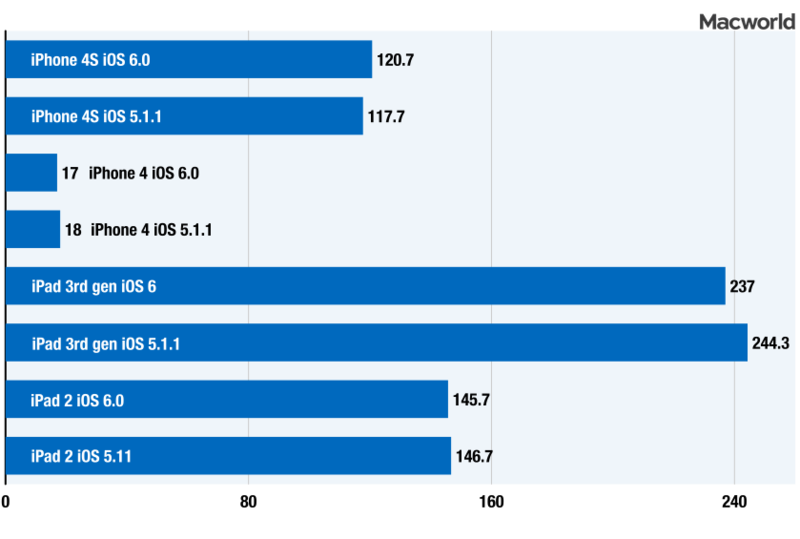 While these results may sway your decision to upgrade your iOS, at least we now know that there is no significant performance downside to doing so. Check back soon for battery life results for these devices, as well as test results for the new iPhone 5.